Leftover Easter eggs?! I got you covered! Put leftover Easter eggs to delicious use with this easy Deviled Egg Pasta Salad! 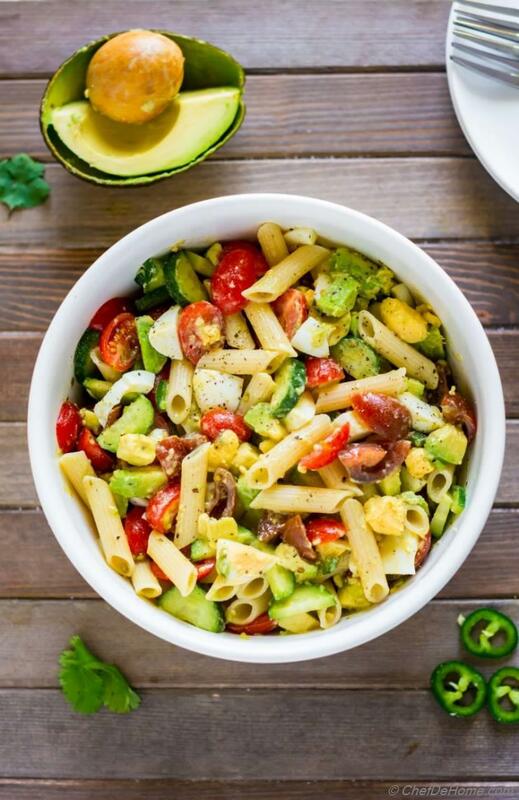 In this egg pasta salad creamy avocados, sweet cherry tomatoes, crunchy cucumber, leftover/boiled eggs meet a zesty lemony dressing.. for a scrumptious after-Easter lunch or dinner! 1) to give some relief to loaded refrigerator. 2) to make my life easy. 3) to eat healthier after comforting dinner and party food. ... after working on 2 of the above recipes.. I had a big batch of deviled eggs leftovers. 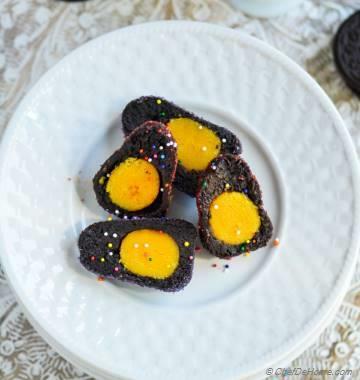 Now, as much as I love serving deviled eggs for party horderves (finger food appetizers)... I don't like leftovers hanging in refrigerator for long... Since eggs will not taste good if frozen, I had an easy solution!! 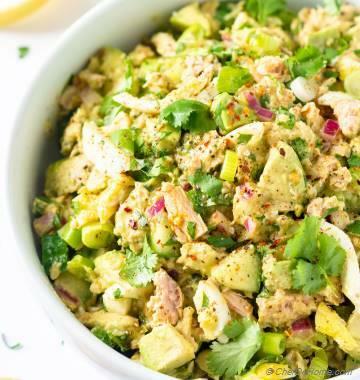 Lightened-up Deviled Egg Salad! Tadaa! Yes, this is not that traditional cream mayo based deviled eggs salad but instead it is healthy egg salad! I'm not in mood to eat anything heavy after the festivity... I might crave a salad like creamy deviled egg salad after a month.. in remembrance of the holidays.. but leftovers are not for heavy salads.. for sure! 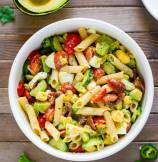 So, this zesty & tangy Avocado and Tomato Salad shined in my Monday dinner! I even used gluten free quinoa pasta to add some whole grains to dinner. Loved the fact that I not needed to work, leftovers gave-up room in refrigerator, and delicious dinner was ready! Life was peaceful again!! Does clean fridge makes you feel peaceful? Or am I the only weird clean-freak? ..continuing my thoughts of healthy egg salad... 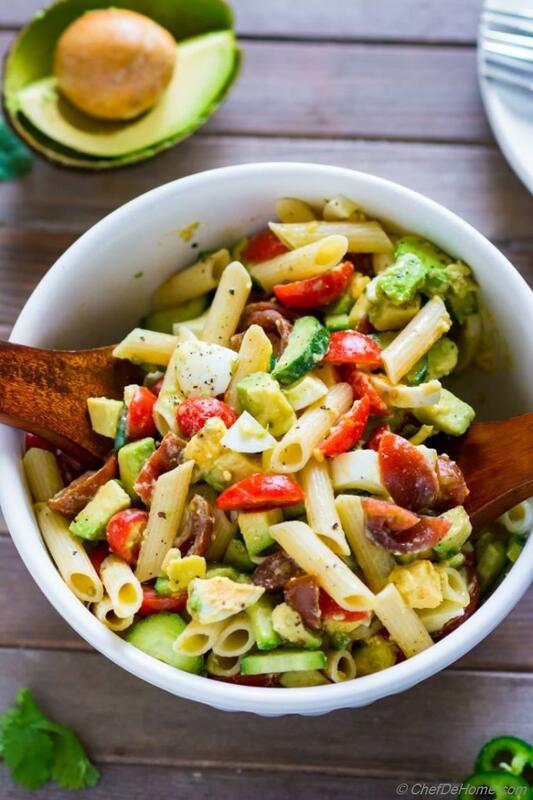 This salad has gluten free pasta, fresh avocados, tomatoes, cucumber, jalapeno, cilantro, and mayo free lemon olive oil dressing. Every ingredients speaks for itself. Not just leftovers Easter eggs, I happily boil fresh eggs just to eat such delicious and clean salad! Plus the combination of avocado with egg! You guys! Nothing can beat that! I think, it is one of my favorite pair of ingredients to put together! Avocado Egg Sandwich, Avocado Pasta with Fried Egg, Avocado Deviled Eggs.. are few of my favorite easy recipes! Speaking of easy, this recipe is easiest of all! 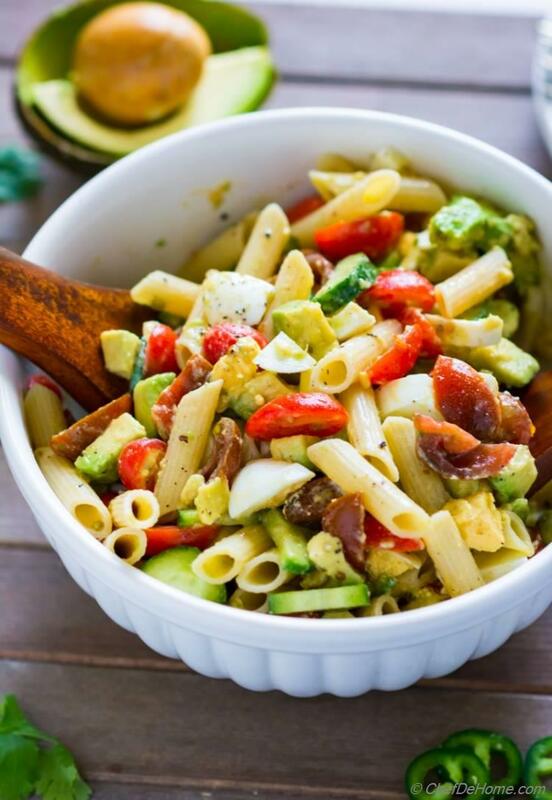 It as easy as cooking the pasta, chopping the veggies, eggs, and mixing in the dressing! Easy, right? I like to cook pasta and let it cool down fully. If pasta is not cold to touch, it can cook the other salad ingredients. So, please make sure to let pasta cool fully. Some pastas will stick to each other when cooling, I like to coat pasta few teaspoons of oil to prevent sticking to each other. When using fresh hard boiled egg for this recipe instead of leftovers.. I let these cool completely as well. As a rule of thumb, all ingredients are at room temperature or cold when mixed together with dressing. Salad can be served at room temperature or chilled. Hard boiled eggs are one favorite of my family. From breakfast to dinner, we find some way to enjoy hard boiled eggs. I'm including a list of some of my favorite hard boiled egg recipe here. I hope you enjoy! Total Time 22 minutes Prep Time 10 minutes Cook Time 12 minutes Difficulty Easy Yields 4-5 Servings Serves 4 Notes No. of servings depends on serving size. 1. Cook pasta according to package directions. Once pasta has cooked, drain and set aside. 2. Dressing: In food processor, add all dressing ingredients and process until dressing is smooth and all ingredients are fully chopped. 3. 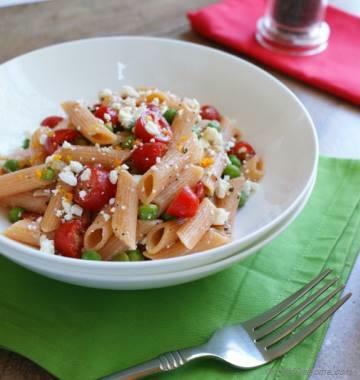 Salad: In a wide salad bowl, add cooked, drained and cooled pasta. 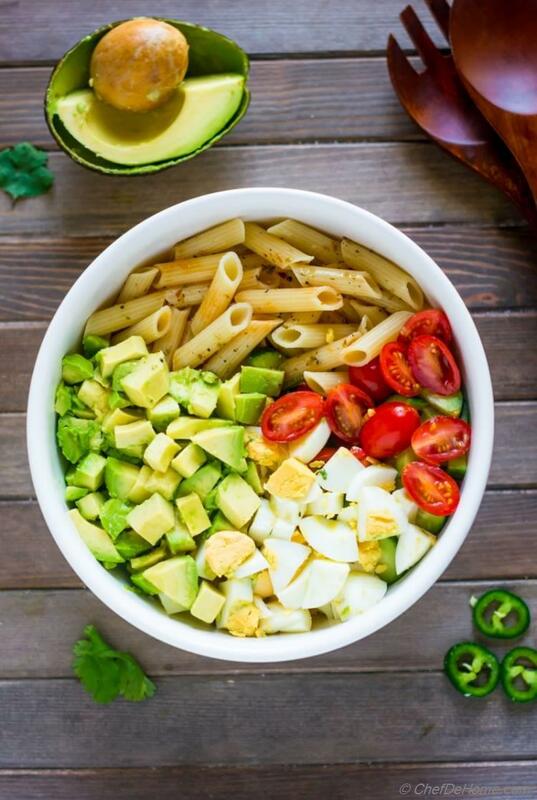 Add diced avocado, eggs, tomatoes and cucumber. Pour dressing over the salad. Toss to coat everything with dressing. Taste and adjust salt, black pepper. (I like to add few more dash of Tabasco if needed.) Serve and enjoy!